Reports say the president is no longer going to Davos, He is cutting his trip short and coming back home to deal with the crisis rocking the country since early last week. President Mnangagwa was set to attend the World Economic Forum meetings in Davos for the second consecutive year as the president of Zimbabwe this week. He succeeded in charming the international community on his maiden appearance in Davos last year although nothing much materialised as investors adopted a wait and see till the election stance. The country’s reputation has taken a massive beating since that time. The election itself was conducted peacefully but protests erupted as results were being announced on the 1st of August last year with people being shot dead in Harare. Even so, the president has been trying to persist in pushing his mantra that Zimbabwe is open for business. The whole episode resulted in the government issuing a directive for the total shut down of the internet. The internet was switched off across the country around mid day last Tuesday, some four hours after access to social media had been blocked on all networks. Connectivity was restored 30 hours later but without access to social media being granted. A few hours after that restoration, the internet was switched off again for more than 15 hours. After that again connectivity was restored but social media remained blocked as it is today. This is the mess the president is coming back to. One can almost feel sorry for the man. Everything has just become complex. The blocking of the internet is being condemned around the world including by ‘The Elders.’ The reputational damage could be a bit too much now. The Ministry of Foreign Affairs insists that the president has pulled out of the World Economic Forum of his own volition. 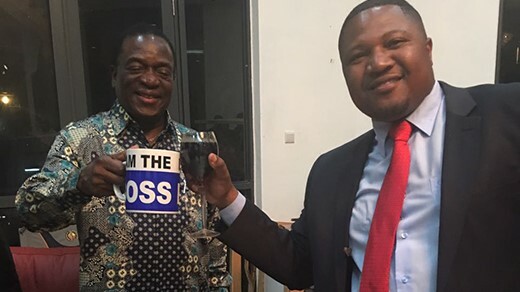 This is because there is an online petition that has been signed by 60 000 people calling for President Mnangagwa to be banned from attending the Davos meetings. Whatever the reasons may be, it should be a good thing for the president to come back and actively lead the resolving of this mess. One of the first and small acts of goodwill he could perform is to reverse the ban on social media and to speak against the block of the internet altogether. His spokesman has already revealed some level of ignorance regarding the significance of that ill advised move when he spoke justifying it. The president can choose to spin out his own story, it can be some PR nonsense for all people care but if he makes the gesture of admitting that the state’s violent reaction and its blocking of the internet was a mistake he could earn some much needed goodwill. Well well well, I hear he is coming back to fight for his position cz there is another coup happening. Any way time will tell. ”The method at which he came into power is the method of his down fall” This is a principle which cannot be disputed. Plebiscite was not a proper thing to remove him. It made perfect sense. No contradiction there. All they did was say tell you what the ministry said and then inform you why they even had to insist it was of his own volition. Perfect sense. Grammar matters and grammatically it makes sense. Just come and switch on the Internet, this is Bullying we got work to do. Not much pleasures in Zimbabwe the YouTube and Twitter take us away from our daily miserable existence in this hell hole we have the misfortune to be born into. Technology is what will drive this regime down the sewer. They ALL showed that they don’t appreciate computers when they ALL ululated as RGM was dishing out PCs to rural schools which did not have electricity. They ALL took stupidity to brand new heights. The cities they want to magically create in the rurals by 2023, will they have internet or pfee-net?